In Episode 49, making our schools' sites of liberation and resistance. Plus challenging the dominant narratives that blame individual students whilst giving scant attention to the social justice, and structural issues impacting on them. Further information and links for my chat with Benjamin Doxtdator, can be found here, pushingtheedge.org/49. 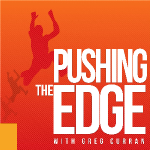 There's also many more Social Justice-inspired educators and community leaders to listen to, in my podcast archive, https://pushingtheedge.org/social-justice-resources. Follow me on Twitter - @GregBCurran - and do let me know what you think of this episode. And if you enjoyed our chat and found it useful, please share it with others. Thank you.